In the competitive and highly regulated industries, organizations need to utilize every opportunity they can to stay ahead of the competition. Due to shrinking budgets and increasing IT demands, organizations are moving towards IT process automation which will help to improve service desk efficiency, meet SLAs and reduce costs. The Service Desk automation solutions like AutomationEdge, not only automate IT tickets but also the non-IT tickets from admin, HR, legal, accounting and finance can be automated. The adoption of cognitive-enabled technologies is radically changing how humans think about and deliver assistance and services to the consumers of corporate IT services. The prediction is by 2019, 75 percent of workers will be interacting with intelligent digital assistants and by 2020, $60B in cost savings through productivity improvements annually for U.S. enterprises. Machine learning capabilities of the automation tools for your service desk can handle unstructured emails and classify them and route it to the correct group for resolution which reduces the burden of your service desk. It can not only classify the tickets and assign it to the correct groups but also provide end-to-end resolution or perform diagnostic steps and hand over the tickets to support engineers at the right stage. This will save time of your L1, L2 engineers where they can concentrate on other important tasks. Chatbot interacts with users and learns to answer their questions using natural language processing (NLP) and machine learning technologies. There is no wait time to respond to the users so SLA will drastically improve and customer will get satisfied with quick responses. In traditional Service Desks, the user interface was complex self-service catalogues, used call and email option to reach support desk to raise a ticket. Service Desk engineer has to perform tasks like answer queries, initial diagnosis, ticket classification & assignment and status tracking and communication. Technical support has to work on all tasks where the 20% cases are repetitive like password reset. With Cognitive Service Desk, there will be a smart interface like email and chat to support desk. 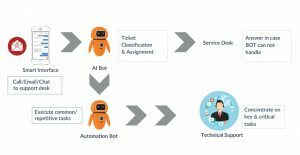 AI bots like AutomationEdge can perform tasks like ticket classification & assignment and execute mundane/repetitive tasks. If any issue comes randomly in the system, incident tickets are raised in service desk. Service Requests are routine tasks like share folder access, increase mailbox size, password reset, take a snapshot of VM, add member to AD, internal VPN access, VMWare – VM creation etc. and the Queries/Information/FAQ are general help quires like how to configure corporate email on mobile, pull information or reports. Enterprise Service Management is evolving with Cognitive technologies like Artificial Intelligence, Machine Learning, NLP and Chatbot to reduce manual tasks and increase productivity and improve TAT for requests resolution.